Field Archives - Q the Experience, Future Life Science. For many years electromagnetic technology has been used in diagnostic and therapeutic devices, in both orthodox and complementary medicine. In the first half of the 20th century many of these devices were somewhat empirical and thus often considered ineffective. The advent of the pharmaceutical revolution significantly diminished the use of electromagnetism, especially in main stream “orthodox” medicine. However over the last 40 years the advent of sound, orthodox experimental work, such as that carried out by Dr R.O.Becker1 in New York, has qualified both the harmful and therapeutic effects of electromagnetic fields. This in turn has led to the publication of numerous specialist papers and books on the subject.2 Now in complementary medical fields, such as acupuncture and vibrational medicine, the advent of computer technology and advanced electronics has led to the significant development of effective diagnostic and therapeutic tools.3 The QEnergySpa, Bio-Electric Field Enhancement (QEnergySpa, BEFE) unit is one of these tools and represents a significant advance in the development of electromagnetic medicine. Having personally worked with the QEnergySpa, BEFE in my integrative medical practice and studied reports of its success amongst colleagues, I am convinced electromagnetic energetic medicine will play a much bigger role in the future. Based upon an interpretation of Quantum Theory, the QEnergySpa, BEFE unit is an Australian device, designed to provide an external source of “negative electron” energy for the body. As the manufacturer insists on pointing out, in this capacity it is not a medical device and does not actually diagnose, cure or treat any disease, or condition. In reality it is a sophisticated spa, energizing the water, which is used as a conductive medium. All living things possess energy fields, thus when a person bathes in the water and takes a QEnergySpa, BEFE bath, the body absorbs the energy provided to use as needed. Since the quality of design and manufacture are of medical grade and the unit is used in water, the QEnergySpa, BEFE has received official approval from the TGA in Australia, (Australian equivalent to the FDA) and is marketed there as a therapeutic spa/medical device. It has undergone stringent testing and has been shown to be safe to use in the manner advised. This unit consists of a double-insulated, step-down transformer producing a smooth, rectified, 24 volt, DC supply to a unique, water electrode array. The design and structure of the array is crucial to the efficacy of the unit, a patent has been applied for. The arrangement of the copper and stainless steel plates, combined with the proprietary electronics, creates specific electromagnetic frequencies and harmonics, which are transmitted to the body through the water medium. In practice part or whole of the body is immersed in the water, and the device turned on for up to 35 minutes. The electrode array causes basic electrolysis of the water, gas bubbles are seen to be released from the plates. The charging effect causes dissolved impurities in the water to be precipitated. This leads to discoloration of the water, sedimentation and the formation of a scum on the surface. Much of this is coming from the water itself and not from the person in the bath, although there does appear to be a significant detoxification effect. At the same time the QEnergySpa, BEFE generates negative electrons, which are released into the water as a waveform, synergistic with the electrical state of the person being treated. The proprietary electronic circuitry ensures the energy waveform matches and enhances that of the individual in the water. Of interest, when some people start using this unit they experience mild tingling or sensations at the site of old operations or injuries. It is thought this may be due to the area becoming energized. Tap water is used and the mineral and chemical content of this varies between areas. Thus the discoloration seen during a QEnergySpa, BEFE treatment will vary according to the water source. Furthermore, in spite of using the same water source, the water discoloration seen varies between individuals and may change with the number of baths or the person’s state of health. The constantly changing bio-electric field around every person and probably causes a unique response in the precipitation of particles from the water, thus causing the unique color changes during bathing. During initial use of the spa the water is often very discolored. As a person continues to use the spa and responds to the energy source, the water color tends to improve and lighten. However these are merely observations and should not be overemphasized. The color change does not relate to toxin release. Response to the QEnergySpa, BEFE may occur slowly with regular use over a period of time. Occasional use may not produce the desired response. People on medications may use the QEnergySpa, BEFE providing they take a bath with this instrument at least one hour before or two hours after taking medication. The reason for this is purely a precautionary measure to ensure nothing interferes with either this instrument or the medication. All medications and supplements should be continued as before and should only be changed under the guidance of the Health Professional in charge of the case. Blood pressure should be checked regularly as anything which causes relaxation, such as a spa, may assist in normalizing it. Use is limited to 35 minutes alternate days. Do not use this treatment during pregnancy or in conjunction with a pacemaker, immuno-suppressive drugs or organ transplant. Monitoring electron generation using a specifically designed ORP (Oxygen-Reduction-Potential) meter, indicates water may run at + 400 to + 450. Once the QEnergySpa, BEFE is running, the ORP reading will charge as the electron content of the water and immersed body is equilibrated. Initially, as the body takes up available energy, the ORP reading changes very little. However when the body reaches equilibrium, the electron content of the water begins to increase and a drop in the ORP reading is noted. The “electron drop” can be slow or rapid, and appears to be related to the state of the individual taking the treatment. Negative figures of – 400 to – 600 have been recorded and may relate to overall vitality and healing capacity. Experts in the field of energetic medicine now speculate the change in electron status of the body is linked to a subtle shift in base balance, leading to an “Alkalinization” of the body. If true this would suggest a possible mechanism for the enhanced vitality and healing attributed to hydrotherapy generally. Perhaps this also provides a key to the alleged benefits of natural spa waters. An increasing number of personal testimonials draw attention to the uniqueness and efficacy of the QEnergySpa, BEFE unit in providing energy for the body to heal itself. In my mind there is no doubt the natural healing potential of the human body has been severely underestimated by orthodox scientists and physicians. Orthodox medicine is generally based upon the principal of cutting (surgery), burning (radiotherapy), or poisoning (therapeutics) pathology to effect what is called “treatment” or a “cure.” This does not diagnose or treat disease. However, by providing negative electrons, it provides energy for the body to use as required, acting as a supportive “spa” or stress relief device and works well in conjunction with other therapeutic modalities. A 45 years old female with terminal cancer of the brain. The tumor could only be partially resected due to its position. In spite of medication she was left with headaches, double vision, facial numbness and pain, tremor of the hands, weight loss and depression. She had lived a month longer than predicted. She began supportive nutritional therapy and took QEnergySpa, BEFE baths every other day. After six weeks she ceased to use this instrument and when reviewed, had lost all her symptoms, regained weight and had determined to return to work. A 42 years old male diagnosed with AIDS following an outbreak of severe herpes zoster, began supportive nutrition and QEnergySpa, BEFE baths for 35 minutes alternate days. He has continued this regime for over 18 months. During that time his clinician has noted a sustained improvement in T cell count and a reduction of viral load. Clinically he has regained energy and continued a normal life. At this point he has not required anti-viral therapy. A 53 years old female, suffering from chronic fatigue and fibromyalgia affecting the back, consented to one treatment. She slept deeply and was tired the following day, after which she regained a new energy level. Back pain was eased and nocturnal spasms disappeared. She had a previous history of prolapsed intervertebral disc with occasional exacerbations of sciatic nerve pain. On one occasion she was confined to bed following such an attack of pain radiating to both legs. Use of the QEnergySpa, BEFE was limited to immersing one hand in a bowl of water, but a single session of 35 minutes still proved effective in relieving spasm and promoting relaxation. Energizing effect in chronic fatigue syndrome. Energizing and strengthening neuromuscular function in multiple sclerosis. Supportive therapy in cancer recovery. Rejuvenating effect in diabetic neuropathy. Symptomatic improvement in neurological conditions including Parkinson’s disease and stroke. Improved memory in Alzheimer’s disease. Enhanced detoxification and excretion of toxic heavy metals. Analysis of urinary toxic metal excretion on a 27 year-old female pre and post treatment showed significant increased urinary elimination of aluminium, peaking at 110 micrograms/24 hours (normal range 0-37). Urinary elimination of nickel, cadmium and arsenic also increased, but none exceeded the normal laboratory ranges. Her results indicate this unit increased meridian energy. What is also noted is the difference between before and after was more marked the first time this instrument was used. Individual reading (data on file) indicated a balancing effect between the left and right pathways following a QEnergySpa, BEFE bath. Finally she noticed a modest reduction in resting blood pressure. Admittedly this is a single case study and the results cannot be extrapolated. However the trend is interesting and indicates the need for further research. In my opinion the QEnergySpa, BEFE unit represents a significant advance in Energetic Medicine. It is a spa device, which appears to be associated with providing negative electron energy, enabling the body to accomplish remarkable detoxification, elimination of heavy metals, and balancing of inherent energy fields. As a therapeutic spa it promises to be an extremely useful adjunct to both orthodox and complementary medical therapies. Initial observations and anecdotal reports indicate it warrants further investigation. Detailed clinical trials and plot studies will be available shortly. In view of the findings and observations recorded in this report, the author would like to recruit suitably qualified practitioners interested in doing statistically significant research in the function and use of this instrument (Bio-Electric Field Enhancement). Those interested should contact Richard Marsh, M.D. by e-mail at, or by telephoning. Dr. Richard Marsh MD specializes in Integrative Medicine. For many years he practised in England as a Primary Care Physician with special interest in Nutritional Medicine and Holistic Cancer Therapy. He has also worked in the Pharmaceutical Industry and been involved in the development of HGH secretagogues. He has lectured extensively on Nutrition and Anti-Aging, and is currently researching Electromagnetic Therapies. © Sept 2001. Dr. Richard J Marsh MA., BM., BCh.(Oxon. ), MRCGP. This article represents the personal views of the author and is for information purposes only. It may not be reproduced in any manner without prior consent of the author. No medical claims for QEnergySpa, BEFE are made or implied. An appropriate health practitioner should be consulted for any medical advice. The QEnergySpa, BEFE technology is based on Quantum Reality Field Science or QRFS. The study of quantum field theory is alive and flourishing, as are applications of this method to many physical problems. It remains one of the most vital areas of theoretical physics today, providing a common language to many branches of physics. A model of the universe can help us to explain why it acts the way it does. To understand how the model is constructed from the theory we need to make it clear what a scientific theory is. The simplified view is that a theory is just a model of the universe or part of it, with rules relating to the model based on observations we make. A model is assumed to be true until an observation is found that no longer agrees with the model. The model is either then abandoned or reconstructed to include the new observation. The electromagnetic field can be viewed as the combination of an electric field and a magnetic field and as a physical, wavelike, dynamic entity that affects the behaviour of charged objects in the vicinity of the field and which is also affected by them. It extends indefinitely throughout space. Almost one hundred years ago Albert Einstein, in his special and general relativity theories, developed mathematical formulas which suggested that time and space are inseparable, that nothing can travel faster than the speed of light, and that the passage of time for a body in motion is relative to that body’s rate of travel through space. Einstein was able to demonstrate mathematical formulas to connect these apparently different aspects of physical reality. Although Einstein knew that all was connected through the underlying structure of reality, he was unable to say exactly how and why this is so and he did not have a visual model to further any such construct. Whilst Einstein’s endeavour to educate the Physics community of the day was cut short by his death in 1955 curtailing the evolution of a possible model for evaluation, the worlds physicist’s could only postulate the construct which had been presented to them previously. The theories however continued to flow with the worlds leading physicists divided between the expansion of general relativity and the more recent acceptance of quantum mechanics. Both general relativity and quantum mechanics were claimed to provide the predictive ability required to set the fundamental foundation of physical Law. With both theories so heavily debated, the search for the ‘Holy Grail’ or the Grand Unification of Physics continued in the hope that a merger would be forthcoming between the two forming the start of any unified space-time equation. To date, most of the current models of the universe remain static rather than dynamic. For the unification of physics a dynamic structured model must be employed. Albert Einstein in a note to the fifteenth edition of “Relativity” summarised this concept by suggesting that “Physical objects are not in space, but these objects are spatially extended. In this way the concept of empty space loses its meaning” . The concept that space is not empty and has substance has never been fully theorised. The current division with Relativity representing the macro physics and Quantum mechanics the representative of micro physics extrapolates any possibility of particle science and field science merging to unification. This raises the question as to whether any such unified theory should have one basis or the other. Current physics deems the existence of four forces, gravity, the electromagnetic force, the strong nuclear force and the weak nuclear force. The evolution of Quantum mechanics gives the physicist the ability to unify three of these forces, the electromagnetic, and the strong nuclear and the weak nuclear, however the unification of gravity has not been possible. “Q-Mechanics” which is neither Relativity nor Quantum mechanics unifies all four forces into one force and one theory. This is achieved through the use of a new fully dynamic three dimensional interactive fundamental field structure that replaces the complete current theoretical atomic model. Not only the current atomic model comes under scrutiny, a revaluation of current mathematical procedure is taken into account to disallow the use of impossible conceptual equations. For the purpose of example, an impossible conceptual equation would be to subtract three quantities from two, to equal negative one [2 – 3 = -1]. This equation can never be realised since it is impossible to subtract a number of objects greater than, what exists. This mathematical concept is not the only one that could be deemed as physically illogical. What is more important however is the use of a three dimensional tertiary based mathematical system as used in Q-Mechanics rather than the current binary to vector conversion system which establishes the spatial coordinates of a physical object (or atomic structure). To fully describe and document the existence of a physical reality requires more than just a three dimensional spatial reference based on the position of the observer. All physical existence has a component called Time. This time component is as physical as the object itself and should never be disregarded. The equation to incorporate the time component is not that difficult, however to understand the full implications of the interaction of time within the object needs far greater explanation. Einstein may have understood the basis of this concept with his time theories suggesting that time itself is relevant to the individual rather than applying a global time standard which effects entirety equally. The effect we know as gravity can also be unified into the space-time equation as an actual part of it without the need for any separate theorem. This complete unification works at both the micro and the macro levels. Q-Mechanics achieves this unification with the introduction of a model which is based upon dynamic fields and their structures. These fields represent the second instance of creation, since the first instance would be the creation of the universe itself. Q-Mechanics does not offer opinion on the first instance of creation. The new dynamic field structure is to be termed as the Matrix structure and proposes to replace all current conceptual models. Current theory deems as existing a number of basic particles of which the universe is comprised of. The numbers of these basic particles are increasing as technology builds higher and higher energy accelerators. The higher the energy accelerator science uses, the more of these basic particles will be claimed as discovery. 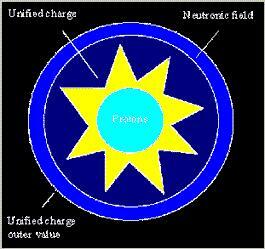 The current initial base theory consists of protons, neutrons and electrons. The protons and neutrons can be broken into smaller particles called quarks. 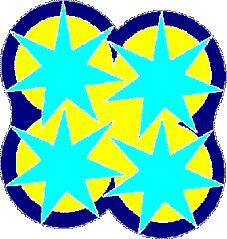 Neutrons consist of two down quarks with -1/3 charge and one up quark with +2/3 charge. The proton consists of two up quarks with +2/3 charge and one down quark with -1/3 charge. It has just recently been announced by experimenters at Fermilab that there is evidence for a structure within quarks. This discovery trend will continue until the level of what Q-Mechanics has termed as the Base Matrix. The base matrix is the smallest possible field structure than can constitute a physical space-time value. To express this value using current mathematical description would be 1.4144986 x 10-16 m3 . When this is compared to the current atomic structure size of say a hydrogen atom, which is 2.1217479 x 10-7 m3 , it demonstrates clearly that light speed technology is inadequate for such finite measurement. Q-Mechanics explains how and why frequencies well in excess of light speed are possible. The Matrix model when understood fully has a predictive ability that eliminates all chance. Should Science start to use such a model it would soon recognise that a complete revaluation of current physics would quickly be deemed necessary. The most important concept that needs to be reconciled before an understanding of the Matrix model can be grasped, is complete unification. To completely unify physics requires a starting point of one from which all evolves or arises (the Matrix). This means one force, one value or one field, regardless of it terminology it is simply one. If one is the starting point for unification, then everything beyond that point is a combination of one, or the same thing. It should be emphasised that Time is an integrated part of the one, however an explanation of this time integration concept only becomes apparent with the complete understanding of the model. With unification represented by the concept one, it is logical that one has no opposite and what are currently deemed as opposing forces are a different manifestation of the same force. To date, no force has been discovered that would suggest an opposite to gravity. With this being the case it is not likely that such a force should ever be discovered. Q-Mechanics explains that this is exactly the case, and that gravity has no opposite. The case for no opposites does not end with gravity, but applies to the complete Matrix model. There are no opposite or negative concepts used to define the Matrix, its action is completely independent of the requirement for the equation having opposing forces such as is the case with the current atomic model. Q-Mechanics explains why due to the inconsistencies deemed as anomalies, the current atomic model consisting of protons, neutrons and electrons is abandoned. The current most popular candidate for the ultimate unified theory is the super-string theory, in which all particles are just different vibrational modes of very small loops of string. Of course this theory is a lot more complicated than just stated, but regardless it has its problems too. In Q-Mechanics the Universal model is fully interconnected at all levels and has zero conflict between the micro and macro since the origin of the macro is an expansion of the micro. There is absolutely no evidence to suggest that the fundamental laws of the universe should be any different at either end of the scale. To understand the universe is to accept the challenge of understanding the greatest puzzle in science today, gravity. Physicists believe that to solve such a riddle would yield the secret or ultimately the grand unification of physics and eventually the universe. Once the actual nature of gravity is defined correctly it will become clear as to just what and why gravity is. Gravity is just as is every other force, an effect. All force which can also be termed as energy is an action, or combination of actions in sequence. Actions or motions are created effects from the effect of existence or that that has substance. Prorogation of any effect can only be achieved via existence or substance. All existence has and is substance. The Base matrix is the source of the gravitational effect and is present and part of every single space-time coordinate in the complete universe. This brings us back to the concept that space is not empty. On more than one occasion during the brief history of physics the scientific community have postulated the existence of what Einstein proposed as an ether or substance in space to facilitate propagation. This idea has never really died, however the famous experiment conducted by Michelson and Morley using light at a time when the propagation of such was not fully understood was interpreted as proof for the non-existence of a universal fabric. Q-Mechanics illustrates that there is a universal fabric which can be measured. This universal fabric is discussed in the book titled Q-Mechanics where it is termed as the universal grid on which everything exists. This book contains enough information about this grid for it to be measured. Figure 2 is a representation of the universe existing as a grid. The Universal grid exists because everything on the grid forms and is part of the grid. The Grid is fully connected three dimensionally, meaning everything in the universe is interlocked and part of everything else. The motions of a body or object moving upon this grid gives rise to forces (effects) that are very measurable using current scientific method. Two of these forces are known and others that exist are explained in Q-Mechanics. The two forces that are known are centrifugal force and inertia, both of which are direct effects of bodies in motion on the grid, so if space was an empty void, which is the suggestion of Earth’s greatest minds, then there would be nothing for a body to interact with and no effect could be created, henceforth the body or object itself would and could not exist. In this same situation centrifugal force and inertia would also not exist due to the simple assumption made by most that their velocity alone gives rise to forces that seem not to exist in the object while stationary. These manifestations are simple interactive effects that are present throughout everything. Once it is understood how the Base Matrix forms the Universal grid and bodies move upon it, the question of the origin of these forces becomes self explanatory. With only a basic understanding of Q-Mechanics all the physical aspects of reality can become self evident. Answers beyond the realms of physics also become accessible to all. The major components of Q-Mechanics have been proven through experiments and devices in recent years, however much of the recent information is not publicly available. It cannot be said for certain just how much of Q-Mechanics is known by the hierarchy of physics faculties around the world, however what is certain is that they are in possession of pieces of such knowledge . Q- Mechanics is the assembly of the complete pieces which is all that is needed for grand unification. In this chapter a step by step system will be used to present a completely new atomic model. Reference will be made to the old model to illustrate the new which will be built in conceptual form to simplify a complex action which will come to be better understood in the latter pages. A brief explanation of current atomic theory was illustrated in figure 7. where protons, neutrons and electrons are shown to be the basis of current theoretical concepts. Figures 8. and 9 are the current first two elements on the current periodic table being that of hydrogen as (1) and helium as (2). In hydrogen there is one proton and one electron but no neutron whereas helium has two protons, two electrons and two neutrons. Upon examination of the rest of the periodic table it becomes apparent that hydrogen with no neutron is an exception to the rule. When dealing with any atomic theory it must be clearly understood that there is absolutely no current technology capable of examining atomic structure at any level. Current magnification techniques or technologies are not even approaching the scale necessary for viewing even a compound of atoms. To help understand any theory it is useful to be aware of the origin of the concept. The development of the currently accepted atomic model is as follows in chronological order. An atom consists of a sphere of positively charged fluid in which is distributed a number of negatively charged electrons. An atom is made up of pairs of positive and negative charges called dynamids that are distributed throughout the volume of the atom. Dynamids were thought to be extremely small and most of the atom was empty space. Alpha particles (+e) from a radioactive source were scattered by a thin piece of gold foil and detected by a zinc sulphide screen. Most Alpha particles passed through the foil with little or no change in direction, but a few were scattered through large angles. By reviewing the results of the Geiger and Marsden scattering experiment Rutherford concluded that the positive charge of an atom was concentrated in a tiny central nucleus and that most of the atom was empty space. Alpha particles only suffer a large deflection when they approach a nucleus closely and this occurs only rarely. A tiny central nucleus containing most of the mass and having a positive charge Ze where e is the charge on the electron and Ze is the atomic number of the element. Orbiting electrons surrounding the nucleus, the number of electrons being Z in a neutral atom. Beryllium bombarded with alpha particles emitted highly penetrating neutral radiation. Chadwick suggested that the neutral radiation was neutral particles which were a combination of a proton and an electron. This differs from today’s accepted theory of a neutron in that Chadwicks model of the atom did not contain a neutron particle, As stated above, a neutron particle was created from an electron and a proton at the time of emission. Before this the neutron particle did not exist. It is only in recent times that the neutron particle has been added to the model which has helped to overcome a small portion of the problems created with having a model based on an opposite concept The largest assumption however, is that of an empty space existing between the particles which infers some kind of a natural void or lack of matter. The concept of a natural void, nothing or zero is not possible, even space itself is not a void. Space is also covered in the later chapters. The step by step technique used to explain the new atom will use current theory as a starting point, replacing each component one part at a time. The first component of current theory to be replaced is going to be the neutron or neutral particle. The replacements are not going to be that of matter but that of fields, that is we are going to use fields and not particles to illustrate the new atom. This first field shall be called the ‘neutronic field’ since it replaces the old concept of the neutron particle. The terming for the neutronic field shall remain in effect for the entirety of the remaining contents in reference to the new atomic model. The placing of the neutronic field shall not be in the nucleus as was the neutron particle but shall be placed around the remainder of the current atom being that of protons and electrons. This placing of the neutronic field around the outside is illustrated below in figure 10. 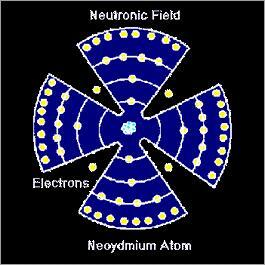 The neutronic field can also be viewed in terms of the program of the atom. This field defines the shape and size of a particular atom or group of atoms. The definition of such a field is determined by its frequency, so the program is the direct result of its frequency. Different atoms are constructed with different frequencies or programs. Figure 10 is a simplified diagram representing the complex neutronic field, however this simplification makes it possible to begin an understanding of such a field. An important point is that the neutronic field is a three dimensional field, however it may be viewed in simple two dimensional form at this stage for the sole purpose of conceptual acceptance. 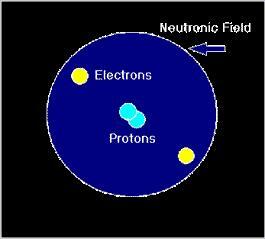 The neutronic field, at this point, can also be considered as the housing for the protons and electrons. The size and shape would determine how many protons and electrons the field could hold at any one point in time. A neutronic field is also not perfectly round, that is, it is not a perfect sphere. The field has high points and low points. These high and low points we shall call bumps and divots. The high points are the bumps and the low points are the divots. Figure 11. illustrates these bumps and divots which are not all the same. The bumps and divots represent the points that define the shape and size of the neutronic field. Figure 11. does not represent any particular atom, it illustrates the size-shape concept only. It is beneficial to start to visualise these shapes in their three dimensional form. So far we have only considered the neutronic field of a stable atom. To gain a better understanding of the shape concept, the neutronic field of an unstable atom such as neodymium is illustrated in figure 12. The periodic table lists neodymium as element number 60 and is considered as having an overcharge or having more electrons than it needs. 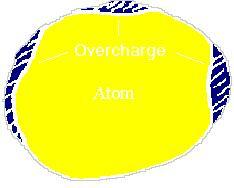 This overcharge is considered as having a value of four, that is the four overcharge is an excess of four electrons. These extra four electrons are not trapped within the neutronic field and can move freely should the right conditions arise. It could be said that the program or frequency of the atom allows a four overcharge. The neutronic field is also a neutral field that is it is neither attracted nor repelled by another neutronic field. The next step in our new model is to delete the electrons. The concept of an electron as a charged particle shall be replaced with another field, that is a field that is neither positive nor negative but unified. This field shall be referred to as the ‘unified charge’. This ‘unified charge’ shall remain in effect for the rest of the contents. Since this unified charge is neither positive nor negative it has no opposite. A unified charge is also attracted to another unified charge, however a unified charge is also attracted to a neutronic field. The attraction of the unified charge to the neutronic field is negative but unified. This field shall be referred to as the ‘unified charge’. This ‘unified charge’ shall remain in effect for the rest of the contents. Figure 13. Representation of a stable atom. Figure 13. is the representation of the stable atom, figure 14. illustrates an atom with an overcharge. 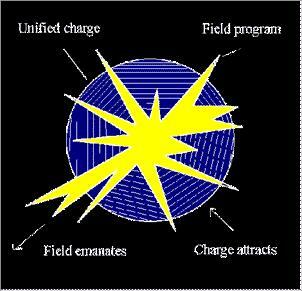 The unified charge is contained within the neutronic field of the stable atom, whereas the unstable atom has some of its charge on the outside of the neutronic field. Just as the unified charge is determined by the neutronic field of the stable atom so is the overcharge of the unstable atom. So far there are no opposites in the new model, nor are there going to be since as explained earlier there are no opposites in real terms. In figure 14. of the unstable atom we can use some charge values to help show the difference between the unified charge and the overcharge. Some rules have been established to govern the new model which is thus far. Unified charge attracts to unified charge. 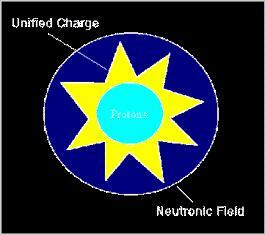 Unified charge attracts to neutronic field. Unified charge attraction to neutronic field is greater than to another charge. Neutronic field is not attracted to a neutronic field. The only part of the original old theory that now remains is that of the protons which we will now replace with another field. This field is to be placed into the center of our new model directly replacing the protons and shall be termed the emanation which shall remain in effect for the entirety of the contents. The emanation is the most complex part of the new model since its action determines the atom. This action can only be considered in three dimensional terms for an atom is a three dimensional object. 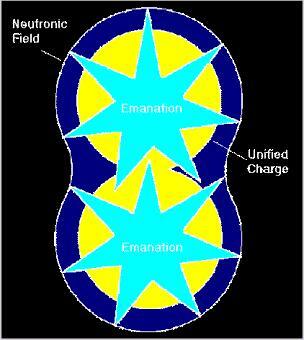 The emanation can also be considered as the source of the program for the neutronic field. The mathematical system used by the emanation shall be covered in a little more detail in a later chapter. The first concept of the emanation field required to be understood, is that the field emanates and this emanation is from a center point outwards in a three dimensional plane. The three dimensional plane can be considered sphere like but not perfect. Figure 15. illustrates the forming of each outward point which combine to form the total emanation. The ends of the lines emanating outward in figure 15. above represent the point or tip of the outer boundary of the emanation. All these points form the three dimensional shape and size of the single emanation. This pattern or program is its frequency. The number of lines shown in figure 15. are by no means a correct amount for any particular emanation since the emanation would have many more points which we are unable to illustrate on the scale necessary. Figure 16. Representation of the new model with the emanation now in the center. The natural overcharge of an unstable atom as illustrated above can be seen in the areas where the emanation does not protrude beyond the unified charge. The areas between the emanations that completely protrude either side of the unified charge would be considered as stable or as areas containing their natural unified charge levels. It is possible however to overcharge an atom beyond its natural stable point which would then be termed as hyper -charging the atom. Hyper-charging and its effects will also be covered in later chapters. Another view of the natural overcharge of the unstable atom is illustrated in figure 17 . The emanation of the atom is also in constant motion. This motion could be described as the forming of the individual points, where each individual point is formed one point at a time with such speed as to appear as a complete emanation. This sequence is covered in more detail shortly. The emanation is not the only part of the new model that is in motion as the unified charge is also in motion. The emanation is also the source of the neutronic field since the neutronic field exists at the boundary of the emanation field. The neutronic field could also be considered as an effect of the emanation field. The emanation field could also be considered as the neutronic field, however it is necessary to keep the two concepts separate at this point since the outer neutronic field plays a much larger part when dealing with groups of atoms. One important point which will become clear later is that single atoms do not exist by themselves. Our single atom is for progressive teaching only. In figure 18. below, two atoms are illustrated to show how the neutronic field becomes one field around the two atoms. This is an example of the 1+1=1 concept where the combining fields form the one field. The emanations however remain two separate emanations. This figure also helps to explain the relationship between the emanation field and the neutronic field since the boundaries of the emanation fields form the single neutronic field surrounding the number of atoms as a unit. Should you add more atoms to the unit, the boundary of the unit will change, hence changing the neutronic field. The atoms can also be seen meshing close together, however they mesh considerably closer than illustrated, which also allows the unified charges to become one unified charge or field. The pattern or program of the atom allows this very close meshing to take place. Should you wish to add more atoms to the unit several conditions would apply. Firstly the program patterns of both the unit you wish to add too and the atoms you wish add must be compatible, that is the programs of both must be capable of meshing together. This can be observed in modern chemistry where some particular atoms will not bond with others since their programs are not compatible, but with the use of a third atom that is compatible with the other two, a bond can be achieved. This bonding system is common and present in nearly all known matter. Secondly the atoms must be allowed to get close enough together to be able to mesh. There are many variables and processes which make this possible, all of which need to be considered on an individual basis. The next chapter is where we will be covering a number of these effects. The close meshing of the atoms is part of what forms the structure of the universe, meaning every single atom is in close proximity to the next as illustrated in figure 19. This concept of atomic structure also applies to space since space itself is not a void as voids do not exist. The atomic structure of space has however never been defined. Some attempts have been made to describe space as an unexplained ether to help negate the concept of the void however it is the structure of the atom that is most important. The close mesh of the atom is not just the product of its shape and size, it is its individual motion that is important and this motion needs to be considered for each individual atom itself and then for each other atom individually within the group. After this we can consider what all the individual actions mean to the group as a whole. Current science could be understood as interpreting the group’s action as a whole, as the singular action rather than the result of the group action, hence the search for things like quarks and other smaller particles. 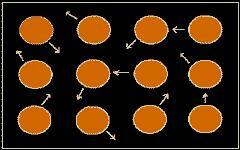 The formation of the motion for the individual atom needs to be simplified for the purpose of initial understanding. The three dimensional motion is its frequency or program, providing it is not effected by an external source. To describe the frequency of the atom would be to select a single point of the emanation field and then track each other point in a three dimensional plane until you had the complete motional signature for that particular atom. A simpler way to visualise this would be to use an artificial or mock emanation field that has very few points in its frequency, then place the emanation field into an elastic bubble which is smaller than the emanation so that each time the emanation forms a point you would visually see the surface of the bubble rise and fall with the emanation field. Observing this would give the view of a pulsating surface on the bubble. Each time there is a pulse the shape of the bubble changes, however this is only part of the view since in real terms some of the emanations will not reach the surface of the bubble, so where this occurs you must visualise the bubble dipping inwards to meet the point of the emanation. All this is viewed in slow motion as this action is performed in real terms at great speed. Once this visualisation is complete use the same motion concept except without the bubble because in real terms the emanation is not housed within a bubble. This motion is considered as a rotational motion as it moves in a three dimensional plane. The rotational motion is the frequency of the atom. The frequency can also be described as a vibration. That is the rotational motion, frequency and vibration are all the same in reference to the new atomic model as they all describe the same motion. An important point about the use of the term vibration is that it is not used in reference to any current conception of the term where it is used and described as a back and forth motion especially in reference to any current wave theory, since wave theory is not a motion that can be used to describe the interactions within the new atomic model. The next step is to consider the action of the atom that is beside the atom whose motion we have just described. If the two atoms were of the same kind they would have the same action except the orientation of the starting points of both atoms may not be the same which is the case in most circumstances. This means that both atoms are not orientated with the same rotational alignment in reference to each other. This applies to each and every individual atom within the group, however it is possible to achieve different degrees of rotational alignment which will alter the effect of the group as a whole. Figure 20. simplifies the concept to illustrate the difference in rotational alignment. The complexity of the whole can only be calculated on the basis of each individual atom. This multiple interaction will be expanded upon as we proceed through the chapters on effects and the advanced atom.